A second view, what can we see? Some might have wondered how last Friday’s blog was weird (at https://lawlordtobe.com/2017/11/10/two-streams-one-view/). That is not a bad thing; it is not with the reader. The writer (read: that would be me) watched too many data sources and too much information on several sides from several fronts, I merely illuminated one path, one journey ever streams of data. More important, even as the Story was published (read finalised) on Friday morning, we see that Reuters reported (at http://www.businessinsider.com/frances-macron-flies-to-saudi-arabia-to-discuss-lebanon-crisis/?r=AU&IR=T) the mention “French President Emmanuel Macron booked a last-minute flight to Riyadh as tensions between Saudi Arabia, Iran and Lebanon heat up“. I am not so sure how ‘last minute’ it was. You see, I already reported on “Credit Agricole SA is selling half its stake in Banque Saudi Fransi to billionaire Prince Alwaleed bin Talal at a discount“, you see, I reported on part of this and I mentioned the Forbes part which had given me “International banks are grappling with how to approach the Middle East’s biggest economy, which blocks foreign control of local lenders. Some are positioning themselves for what’s expected to be a free bonanza as the kingdom overhauls its economy and plans to list Saudi Arabian Oil Co. in what could be the largest-ever initial public offering” already. This free bonanza is part why some of the most eager people trying to become a wave of new billionaires are there. If they have the Gaul, the vastly above average intelligence and the backers, those three will allow for the next few years to make another 300-500 new billionaires. In that light the move of Credit Agricole to leave did not make sense to me. You see, they are greed driven like pretty much any other bank, walking away from a profit bonanza makes no sense at all. The fact that these parties are trying to unload what they have to Prince Alwaleed bin Talal makes little sense. That is until you realise that these people might have been in business with the 200 arrested individual. Yet in this we see that the entire issue goes further when we see that ‘Prince Alwaleed Bin Talal Arrested in Saudi Crackdown‘, so was the event set up for tactical reasons? Do you think that if he had seen his arrest he would have bothered with the sale as it is? The fact that his links with JP Morgan and their facilitation of the sale means that there is a lot more going on behind the screen. You see that share is well over £372 billion; do you think that the media is showing us all? There might be a crackdown, but is it a crackdown? Is it royal annexing of squandered goods or is its trial and a showdown where the other members of the Saudi Royal family are shown that disruption within the ranks are no longer tolerated. In all this what is next? You see, from the view we are given, the existence of these international banks are essential to creating a non-oil depending economy. A new economy set towards services, technology and pharmaceuticals. There is plenty of value in all this for Saudi Arabia to move forward, yet the track will be a lot longer if there is disruption in the ranks. France might have been hard on Hezbollah and as such they are a pleasing presence towards the Royal family of Saudi Arabia, but more important, Banque Saudi Fransi is merely one of several players with trillions in value available. In military terms France is a better beachhead for Saudi Arabia to enter the new fields of economic growth in several ways. The moment the growth in France is seen the other nations will jump like hungry rabbits to the fields of vegetables in a mere instant. France is leading the way because it is figuring out that the present course is not working. Yet, is any solution so polarised? Saad Hariri has proved that today. Period. It is the view we have always seen and as such that truth is pretty much undeniable, so now the moment is primed to get this sorted and to get the changes made earlier, there is seemingly no downside to any of this, political Europe merely preferred to sit on their hands when it came to this terrorist organisation (Hezbollah that is). I believe that Saudi forces are considering that Iran will be more and more limited to create turmoil when there is no Hezbollah. As they can no longer facilitate through others, Iran must openly act and turn the world against them or fall in line with the Arabian Leagues and behave according to those voices. At that point Qatar must also adjust many of their policies, and the impact might not be predictable, there would be enough evidence out there to show that they need to adjust in many ways. I believe that this would end up with Saudi Arabia wielding the only voice of power, dissent in the Middle East would end to a much larger degree. As I personally see it, there would be clear benefits for the state of Israel as well. As the threat to Israel ends, it can focus on growth in a way they have not been able to do for decades. There will be clear impacts for the UK, Russia and the USA too. Their diplomatic games will likely fall on ears much less eager to please them. It will be about growth for the Middle East. I believe that this shift will continue into Europe and several Commonwealth nations as well. India might be a frontrunner to grow the generalised pharmaceutical markets. The US will have to water down their wine to a much larger extent and there are options for the US, but no longer at the vulture driven profit margins they used to have. A shift that will take several years and that is where those ‘free bonanza runners‘ currently in Riyadh could make their billion(s) over the next decade. It will be risky to some extent, but art present you run large risks and end up making nothing in Europe at present. So why stay there? I could be wrong but there is enough evidence out that that I am more likely than not correct. Business Insider, Forbes and the Financial Times have shown these paths over the last 6 months more than once. There is one premise that needs to be pointed out. The direction that this path opens is based on two elements. The first being how the drill-down on corruption in Saudi Arabia is playing out and their true intent on shifting their economy away from their petrochemical side. The more correct those paths are, the more reliable the outcome is that I predict. The corruption crackdown remains a factor as this has never happened before to this degree. I applaud it but I also realise that as this becomes a success a new Saudi Arabia will rise up in the global markets, one that is not in internal strife and one that is breaking out all borders to grow their economic footprint. It is not the status quo the current powers in charge have ever considered and it will make a lot of ‘old’ billionaires very nervous. This might not be a bad thing either! As I see the news pass by, events shown on separate media, I notice myself wondering if my life had any meaning at all. I was young and I went to the Middle East in 1982, I would return in 83 and 84 only to learn that there was change. Terrorists like Hezbollah and Hamas were only small and Hamas rose as I would see in 1984, yet I thought that change would be inevitable. I saw Hezbollah as nothing more than pesky small minded terrorists, a tool to be used by Iran and Syria. Yet even as Lebanon was trying to move forward, there were signs in media and some places that the US needed Syria too much, in their case dealing with Saddam Hussein and as such many of us thinking we would fight for peace, we only fought for the borderlines that the US decided needed to be in place. It must have been the late 80’s, I was not longer in the Middle East and not all clued in towards the events of the day there. You see DARPA had not rolled out the internet at that point; ARPANET was not available for the audience at large. So today I see that the more things change, the more they stay the same. Now we see another push against Hezbollah. You see Saudi Arabia has had enough of those terrorists and is pushing back hard, it is also willing to push against Iran. I see two issues. One is that this issue will be bloody and even as we hope for the victory of Saudi Arabia there, there are more than just a few markers showing us that the three largest players (US, Russia and UK) are not completely in agreement whether the Middle East should have one clear dominant party. The issues in Iran, Egypt, Saudi Arabia, Libya and Kuwait that have been going on for half a century should show that. If that had not been the case Hezbollah and Hamas would have been little more than an inconvenience and they would have been dealt with a long time ago. So even as I see certain steps being taken I need to wonder if Saudi Arabia is pushing for a resolution, what will the larger picture show as it shifts. As that unfolds where will the US and Russia stand? What actions, or inactions will they use to leave the Status Quo in the middle east in a place called ‘as is’? The evidence for the longest time has shown that they pronounce whatever allies they have, but in the end, they only care for their needs and options. Now, this is not wrong or immoral, it is merely the way any nation plays its game. It is not a new game, it goes back even before Nicola Machiavelli thought it was a god idea to write down certain options for politicians to be. As per Friday morning, we see: ““Due to the circumstances in the Lebanese Republic, the kingdom asks its citizens who are visiting or residing there to leave immediately,” a Foreign Ministry source quoted by the news agency said, adding that Saudis were advised not to travel to Lebanon from any country“, so even as we can merely speculate on what comes next, the onus is now pushed on Iran and what it is going to do with its terrorist ally Hezbollah. There is one opposing side which was shown by Reuters (at http://www.reuters.com/article/us-yemen-security-saudi-insight/deep-in-yemen-war-saudi-fight-against-iran-falters-idUSKBN1D91UR). With: “The dysfunction is a reminder to Saudi Crown Prince Mohammed bin Salman that his campaign to counter arch-enemy Iran in the Middle East, including threats against Tehran’s ally Hezbollah, may be hard to implement” we acknowledge that Iran has resources and skills and they are driven, both sides clearly are. In my mind, is the additional theatre (read: change of scenery) a workable factor? It does put larger pressures on Iran to get the logistics and goods underway, which will be their weakness to some extent. It is equally an issue how Russia will react. They might not openly act in this placement, yet the clear support to Hezbollah and as the times of Israel states: “the truth is that since Russia began its open military activities in Syria, Hezbollah fighters are also learning Russian methods of war, becoming familiar with advanced Russian weaponry, coming to understand the latest Russian technologies, and in some cases, actually fighting alongside Russian special forces“, we might comprehend the skills and training of the Spetsnaz Malcheks, or the ‘Войска специального назначения’ as they call themselves. In one part Avi Issacharoff omitted or decided not to implement one view in his story. In the end when the Spads are not holding their hands, Hezbollah remains what they were trained enthusiastic terrorists, they are only an army in the smallest sense of the total concept, this also means that as logistics falters, as support dwindles the armed Saudi forces will be more than a match and should gain the upper hand. Now, this can only play out if there is a stalemate between Russia and USA, because if the USA backs down and Hezbollah gets open on the ground Russian support, it becomes an entirely different slice of cake and all bets are off at that point. Only the Russians could push Hezbollah in way that the Iranians could never do. You see, if Iran enters the theatre the game changes as they become a clear and present danger to the state of Israel, their vocal insinuations made that so, so as Iran is trying to get a foothold whilst Israel has a few ways to counter them, we will see a more underground event of escalations where Iran is unable to counter a war they never have faced. You see their words (Iran that is) might look good on the news and on PowerPoint presentations, yet in the true data parks there is no setting, because in the end, this generation of Iranians have never faced anyone like Israel before and their faith in their own internal governmental presentations will make them even less prepared. So at that point it is merely a scuffle between Hezbollah and Saudi armed forces and in that equation there is no option of even a remote stalemate for Hezbollah. Is that the goal? I believe that Russia saw Hezbollah as a tool for what they needed, the US has always been hostile and Europe requires high earnings, so the ECB is very much not in favour of any outspoken hostilities against anything that can downgrade their earnings, so they are seemingly steering away from these events as much as they can, yet I will admit that is just me speculating on European events in this case. Even as London is more and more outspoken anti-Hezbollah. Amsterdam and Stockholm are not taking that path. In my mind it is the liberal multicultural flag that they embrace, in that atmosphere a group like Hezbollah can easily hide under this ‘veil’ whilst hating multicultural events as much as possible. This again has speculative sides, but it is based on solid data and events. You might think that it does not matter, but it does. As more and more nations in their liberal mindset hold off on an actual war on terror, being it for economic or philosophical reasons. Not being part of it is equally a problem down the track. So as we move back towards Lebanon and Hezbollah, we need to realise that not only will this become ugly to a larger degree, there is every chance that unless certain actions are taken the issues seen in Aleppo will be seen in Aleppo too, there is just no way to tell to what extent. In this we can look at Survival Analyses (or listen to the song ‘as time goes by’), where the point in time and the prolongation of all this is the setting on just how much Beirut will look like Aleppo in the end, time is the only factor required here and the people in Europe know this. So as we see the news prepare on how there should be talks and there should be armistices, they all better remember that it was their need for status quo that is pushing the consideration for a terrorist organisation. Who in Europe would have ever thought that support of a terrorist organisation would be the cool thing to do on September 12th 2001? So consider that and now wonder why Europe is, for now, again sitting on their hands or even contemplating siding to the larger extent with Hexbollah? Yet there is also good news because with the actions by JP Morgan to push into large chunks of the Middle East and more notably the push towards the Kingdom Holding Company. You might think it is not related, but it is. It gives the view that JP Morgan is a facilitator for setting maximised profits and these profits are not to go towards France. There has been a thought that the US is not commitment, but as there is profit in war, the clear fallout of any war is opportunity. It seems to me that the US wants to get as much profit out of that as possible, so as the dominoes are pushed into place, we see a situation where the media proclaims JP Morgan to be a mere financial advisor. I believe that to be incorrect. Even as Reuters reported “JPMorgan is in early talks with Saudi Arabian companies about overseas listings“, that might be true, but JP Morgan has been pushing itself and its ‘friends’ into powerful places where lucrative revenues are not set in millions, but in billions. I cannot answer whether Credit Agricole did the right or wrong thing, they are pretty clever all by themselves. I think that the Saudi issues in play now are pushing for polarising fields of options and opportunity on a global scale. In this case my view will be proven over the next 2 years as we follow the money. They question is where the source will be set and who gets to fill their bucket list from that well. when the options are returned in billions there will be plenty of players, although in this instance I believe that the outside opportunities (non-Saudi based companies) are offered to the friends of JP Morgan and them only, which is again a speculation. Whether I am right or wrong will be initially shown in the next 20 weeks. There are however facts available to see that there is a direction in place. Reuters show on part (at http://www.reuters.com/article/us-jpmorgan-saudi/jpmorgan-sees-more-saudi-firms-looking-at-overseas-listings-after-aramco-idUSKBN1D7107), some might think that “He said listings in New York, London, Hong Kong or Singapore might help increase the liquidity of these companies and make them attractive for international investors, he said” is the part that gives the goods, yet it is the part not seen and more interestingly not implied that gives power to it all. The implied part is seen with “Commenting on the anti-corruption drive, Pinto said: “If it is done in the right way and for the right reasons it is good to do for the future of the kingdom.”” It is however only the first part. The news given with ‘Saudi Arabia detains 201 princes, businessmen in $100 billion corruption probe’ (at http://www.abc.net.au/news/2017-11-10/saudi-anti-corruption-probe-finds-$100-billion-embezzled/9136608). This was not a sudden part, this had been in play for some time. It was not merely the fact that at present 201 people are now in custody. Even as we see mention of Iran and the Lebanon pressures, we see that there is a larger play. His Royal Highness King Salman bin Abdulaziz Al Saud and Crown Prince Mohammad Bin Salman Al Saud have been on a path to get the nation reformed and moved away from oil dependency. In this the pool of plenty does not last too long when 100 billion get lost one handshake at a time as more and more people are connected to unlimited resources and wealth. As the press seems to be focussing on the crown prince and the ‘wild ride’ he created, there is a larger issue that is not too much in focus. No matter what the sceptics state, There is a clarity that Saudi Arabia is seriously considering that the age of oil is dwindling, as this happens they need to be able to push into other directions and they do have the wealth to create vested interests in pharmaceuticals, consumer goods, consultancy services and educational advantages. Forbes has had its share of articles on the matter, and whilst some look at ‘Saudi Arabia Looks To The Private Sector To Meet Growing Healthcare Demands’ it seems to me that 5G facilitation has much larger and more profitable sides as other providers are considering what to do, Saudi Arabia has the option to facilitate to the largest 4 cities and exceed in opportunity what Sweden has for its entire nation. When there is such a population (9.5 million) in 4 cities, there is an option to grow and grow fast. Now we know that there is a lively market already, but the idea that other services could be added grows the Saudi options to add markets and manufacturing opportunities through investment. I all this JP Morgan is potentially the spider in the centre of the web, growing in value and wealth from all sides at the same time. There is no way to state why Crédit Agricole walked away from those opportunities, but I feel certain that they did not walk away, the merely moved to a place around the corner. Even as the Financial Times (at https://www.ft.com/content/0e629bab-494c-34d0-8fe0-f71c8b089118) show mixed results, yet I believe that this French bank is moving into different fields, acquiring other banks and setting new goals. I have no way to tell on the why of it but I feel that moving away was only one as the clever people in this bank have agreed on a strategy that allows to grow faster and on larger fields. How? We will learn this over the next 20 weeks. Yet no matter what is done and how the banks react is not a given, the direct dangers on how things escalate in Lebanon and with Iran seems to be crucial in all of this and I reckon that we will see the shifts quite soon. These shifts will not be through armed conflict, but will rely on the pressures and stresses that exist at present. In this Europe seems to take a ‘diplomatic’ stance (at http://www.ecfr.eu/article/commentary_destabilising_lebanon_will_only_strengthen_hezbollah_7235), yet with “Europeans should veer the other way, taking measures that aim to preserve Lebanon’s stability and governance structures, and to prevent wider conflagration. Iran is clearly a key source of regional instability, and Hezbollah has become increasingly assertive in Lebanon” it seems to advocate a path of inaction, 3 decades of inaction have shown that there is no solution on that path, a stream of casualties, of non-actions and broken promises. Saudi Arabia (and the USA) both had enough, and as Iran seems to be an annoying thorn in the side of Saudi Arabia, they have seemingly decided to take Hezbollah out of the equation. This will be interesting, because the moment Hamas and Iran realise that the gig is finally up, I wonder how must tearful pleads of ‘negotiations’ will be shown on nearly every soft hearted news channel on the planet. Perhaps a recollection of March 2016 is needed. With: “Hamas on Sunday sent a delegation to Egypt in an effort to beseech Egyptian security officials to stop destroying its tunnels out of Gaza. These terror tunnels, employed by the terrorist group for nearly a decade, are used to store weapons, smuggle supplies, and infiltrate enemy territory – Israel – as well as carry out surprise attacks in which people are killed and soldiers abducted.” (source: Breaking Israel News). It reads like “please let us be terrorists a little longer, we need the tunnels to do naughty things”. There is every chance that this falls on deaf ears, because as Israel is optionally no longer pressured in possible two front wars, they can fully focus on Hamas whilst Saudi Arabia will only have to deal with Iran after that. It will truly change the Balance of Power in the Middle East with Saudi Arabia as the only true power in that region, all because to a larger extent, Europe decided to remain in a self-imposed state of inaction. After three decades they still haven’t learned that inaction against terrorists will never ever lead to any solution. Yes, there are a few elements of speculation from my side, but it is based on gathered facts and it I do not believe it is less likely on the balance of probabilities, it is merely one optional setting in a larger game that has been played for much too long. France decided, Emmanuel Macron is now the President of France. I will not shout some ‘hack’ issue. I believe that France made a choice, how well the choice is, is something that the President-elect of France will have to prove to be. Not the lame statistics on how young he is. The Guardian gives us some of the optional bad news (at https://www.theguardian.com/world/2017/may/07/theresa-may-congratulates-macron-on-victory-as-eu-breathes-sigh-of-relief) where we see: “Happy that the French have chosen a European future. Together for a stronger and fairer Europe.” No, they did not and your rhetoric only is a first piece of evidence that the EU and the ECB are considering a former investment banker to be the reason to play your games, forcing people deeper in debt and slowly turning the EU into something despicable. For the most, the article is fine. Today will be all about congratulating President Macron, whilst those shaking hands, calling the Palace or sending letters are desperately trying to get a few political punches in. That is part of the game, yet the dangers due to the greedy need of the USA is about to become actually dangerous. Marine Le Pen could have sunk those dangers, although it would come with other issues, there is no denying that. Yet the economic health is going to be a first, in that Crédit Agricole, BNP Paribas and Natixis would guard against that happening to France (after they take care of themselves and their needs), yet will it be enough? The quote that President Macron is giving now is: “I do consider that my mandate, the day after, will be at the same time to reform in depth the European Union and our European project,” Macron had told reporters, adding that if he were to allow the EU to continue to function as it was would be a “betrayal”. It sounds nice, but over time and especially as we watch delay after delay will we see if he is actually made of stern stuff. Time will tell and there is no way that it would be regarded as fair to see any initial headway until at least 10 days post forming his government. Yet there is a side we must take heed from. It is seen in the quote “he spoke out against a “tailormade approach where the British have the best of two worlds” creating “an incentive for others to leave and kill the European idea, which is based on shared responsibilities”“, this sounds nice, but responsibility also implies accountability, a side that has been absent from the EU and the ECB with ongoing lack of transparency for the longest time, in that Brexit remains a valid step. So why do I seem to be freaking out? shows us: “The Dodd-Frank Act creates the Financial Stability Oversight Council (“Council”) to oversee financial institutions“, that part is now effectively gutted from the Dodd-Frank Act. The damage goes a lot further, yet as I see it, the people in the White House have just enabled the situation that what happened in 2004 and 2008 can now happen again. When that happens the Euro will take a massive hit too. With Brexit part of that damage can be averted and in layman non diplomatic terms, we can state that as JP Morgan is getting the hell out of Brexit, the damage they could potentially cause in the near future will be on the books for the places that they go to or remain in. One of the dangers is seen in the key principles of the Financial Choice Act. With ‘2. Every American, regardless of their circumstances, must have the opportunity to achieve financial independence;‘ we can read it in a few ways, one of them being that this is the sales pitch where the Greater Fool can invest in something, using funds that person does not have whilst endangering whatever financial future they thought they might have had. It basically opens a door to get some of the suckers’ bled dry fast. In addition with ‘3. Consumers must be vigorously protected from fraud and deception as well as the loss of economic liberty;‘, I do not see protection, I see a setting where basic protection is in place, yet as we have seen with the issue in 2008, the amount of people who lost it all whilst prosecution failed to protect the people and convict the ‘transgressors’ nearly 100% is just too stunning, and it is a lot more dangerous now as the global population has nowhere near any level of reserve of protection compared to the last time around. In addition, when larger firms start playing this game, they will drag whomever they passively claimed to protect (like retirement plans, like mortgages they held) with them. There is another side which takes a little longer to explain. Yesterday someone tweeted an image I remembered when I grew up. You see it is all linked to what I was part of in the 80’s. I saw the application of segregation, isolation and assassination in a less nice way. It drew me back to my childhood, when I was introduced to practices by the Nazi’s in WW2 during my primary school history lessons. 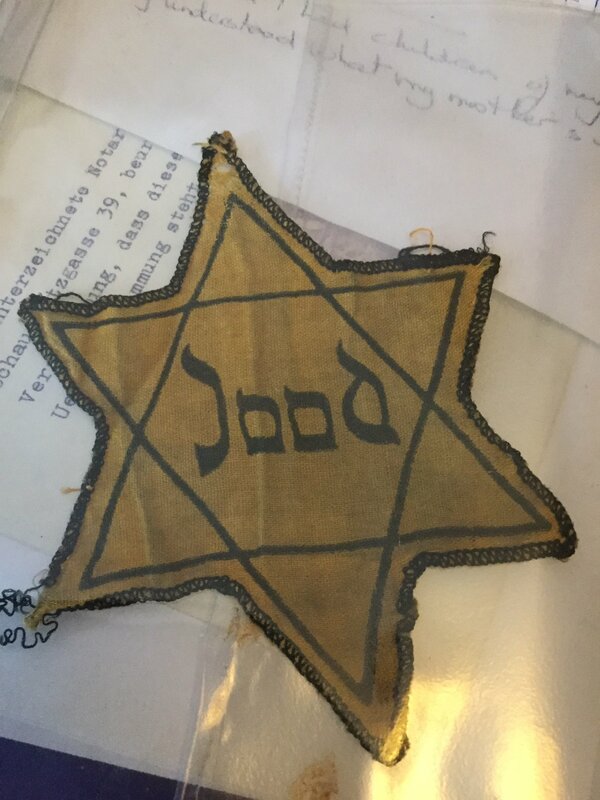 To identify the Jewish people, they were told to wear the Yellow Star of David. When I saw the image my thoughts started to align, unlike the puzzlement of the population at large in 1941-1943 as the star was made mandatory in several nations, the people were uncertain to the matter, with the exception of the Dutch underground who would not trust any German for even a millimetre, they were able to hide 25% of the Jews, so in the end well over 100,000 Jews were deported. From those only a little over 5,000 survived. The Dutch underground was able to keep close to 30,000 hidden, with well over 2/3rd surviving the war. Most people, would not learn of the actual fate of the deported Jews until much later, many remained in disbelief for many years after the end of WW2 in 1945. You see, it is that phase that I feel we are in now, we seem to be in disbelief as laws are past to give a sector of industry more leeway, whilst they (according to some sources) made 157 billion in profit and that is in the US for 2016. So you want to open the tap for a system that is less regulated, non-trustworthy and have shown in 2008 to embrace all greed at the expense of anyone else? How is that a good idea? So what evidence is there? Well, there is Senator Warren (Democrat for Massachusetts) who called it an ‘insult to families’, in addition we see “so that lobbyists can do the bidding of Wall Street“, which is still a political statement. When we see the partial part (at http://financialservices.house.gov/uploadedfiles/financial_choice_act-_executive_summary.pdf), we see “Provide an “off-ramp” from the post-Dodd-Frank supervisory regime and Basel III capital and liquidity standards for banking organizations that choose to maintain high levels of capital. Any banking organization that makes a qualifying capital election but fails to maintain the specified non-risk weighted leverage ratio will lose its regulatory relief” It is the very first bullet point and leaves me with the situation that banks have no right to relief when they take a certain path, yet they still get to gamble. I especially like the part in section 4. “Make all financial regulatory agencies subject to the REINS Act, bi-partisan commissions, and place them on the appropriations process so that Congress can exercise proper oversight.” Yet, the REINS Act only passed the Senate, yet is not law at present, in this it is called on to do what? If the Financial Choice Act is set into law before the REINS Act, the US will have a gap the size of the flipping Grand Canyon, in addition, from the McIver Institute we see the opposition from the Democrats with “The REINS bill is similar to legislation moving through congress, but with lower thresholds“, yes, that has proven to be a good idea in the past! Still it is a view of Democrats versus Republicans and it is a Republican government (House, Senate & White House), so wherever are the clear academic dangers? We get that from Mike Rothman, president of the North American Securities Administrators Association and Minnesota commissioner of commerce with “It is clearly evident that the changes contemplated by the bill would significantly undermine and compromise the ability of regulators to effectively enforce financial laws and regulations“, whilst the I saw the term “this voluntary state-federal collaborative framework“, so the collaboration is voluntary, not mandatory. In the last decade, when have we seen a proper level of protection in a voluntary state of any matter? The one I had a stronger issue with is the one that tosses responsible spending around. The issue ‘Remove requirements under the Durbin Amendment that guided how much credit card networks could charge retailers for processing debit card transactions‘, so basically by charging stronger on debit cards, people will see a need to pay cash or force the credit card risk on people who for several reasons prefer not to do so. In addition the restrictions to arbitration will give leeway to Financial Institutions to avoid all kinds of courts as the victims (called consumers and investors in this case) any right to hold the financial institutions to account. It is rigging even stronger an unbalanced system. Marc Jarsulic, Vice President for Economic Policy at the Center for American Progress called this ‘a system that removes protections against taxpayer-funded bailouts, erodes consumer protections, and undercuts necessary tools to hold Wall Street accountable‘, which was already an issue at present making it a lot worse. It seems that the junior workers of 2008 are now in a place where they would prefer to fill their pockets before their luck runs out. The last bit is purely speculative from my side and it might take until 2020 until I am proven correct, yet at present 2 years is a long time to await the dangers of a greed driven system to get a little greedier. It is in that that segregation from the Euro will become essential soon enough, especially as there is no one muzzling the ECB and its crazy need to spend funds that they do not have and will not have for years to come. As for the news we see appear at present on Bloomberg shows my correctness from another side. At https://www.bloomberg.com/politics/articles/2017-05-07/a-reverse-trump-tax-plan-delivers-an-economic-miracle-in-sweden, we see how a reverse of the Trump ideal works a miracle in Sweden. Now, it sounds a little too good to be true and it is. You see, I am not against the principle that Sweden has, yet in Scandinavian terms, the Swedes are uncanny social. I once joked that a woman can get married, after a year she gets the bun in the oven and gets paid maternity leave. If she starts making buns non-stop, she will never work another day (as long as she gets pregnant immediately after giving birth), 20 years and 22 kids later, she still has an income, a sound and secure retirement fund with only one year of work. It is almost true and I admit far far fetched. Yet the social side of Sweden allows for this. Because that one person will be the utter outlier in any statistical graph. The Swedish solution works in a social educated country like Sweden. In America which fosters self-centeredness and greed, this system would be abused at the drop of any hat and the system would collapse. You see, Bloomberg does not mention, that unlike America, companies in Sweden do not shun taxation (IKEA seemingly being the exemption to that rule), which is also a huge difference. In addition, Swedish Civil Law has a sizeable extensive system of Administrative Law which would also contribute. As we see commerce in Sweden increase, the Swedes will automatically feel the brunt of that in a positive way (as I personally see it). Yet it is not all good and summer there, as Magdalena Andersson faces a vote of no confidence if certain changes are not stopped, or even more adamant, be rolled back to some degree. It is this combined view that France is now seen as ‘Vive La what?’ It is very much on how certain banks and the ECB are called back to stop endangering the future of too many people, Quantative Easing be damned. It is in that environment that the Financial Choice Act is an upcoming danger as Wall Street gets to be in charge of how money flows, in what direction, risky or not. As for what happens between now and 202, I truly hope that I am wrong on every count, because the 2008 global losses which have been estimated to set around $15 Trillion could easily be doubled this time around. More important, as global national reserves are none existent, the impact will hit the consumers and retirees in ways that they cannot even fathom, it makes the hardship in Greece look like a cakewalk as I see it. I will happily be wrong, yet the visibility we already see at present sets me more likely than not correct, which is really scary, not just for me. Oh and if you doubt me in this (which will remain forever valid), why have we seen massive levels of misinformation from papers with ‘NO ONE wants to risk GREXIT’ Economist says Greece bailout will go ahead to SAVE Eurozone’ (source: The Express), whilst we know that you cannot be set out of the Euro or Eurozone involuntary, and ‘saving Eurozone’ is a little strong is it not? Or the Daily Mail that gives us that Brexit is a gift to the Greeks. This is not merely a point of view, certain sources are adamant to misdirect the focus of the people, if the Euro was such a gift from the gods, misdirection would not have been needed, would it? Can anyone explain something weird to me? The news is given (at http://www.theguardian.com/technology/2014/nov/14/twitter-given-junk-credit-rating) to impress upon us a combination of values and steps that are beyond immoral. Consider the tweet, tweet twitter engine. I use it almost every day, it is the one unbiased part where we can follow events, people and companies so that we keep up to date, small messages that bring the actual information. A company that had a massive idea, is making money, when we see the quote “Jim Prosser, a spokesman for Twitter, pointed to S&P’s own words as comment: “Twitter will continue to experience very strong growth and not encounter a significant increase in competitive pressure.”“, we see issues, but is anyone seeing the question behind it? Then we see the one little gem hidden in all the text “The rating is unsolicited“, is this part of the issue? You see, as we look at companies, their revenue, their profit and some might consider their contribution, so as we look at it why is S&P suddenly decided ‘Twitter given junk credit rating‘? It seems to me that there is an economic shift going on. As companies are doing well, they are now getting downgraded for not meeting the expectations of some analysts. Yet, where is this world going to? Consider the application of morale (a word not found in a financiers dictionary) and reasoning for my thought train at present is the following: ‘Forex-rigging investigation: George Osborne gives full backing to SFO‘ (at http://www.theguardian.com/business/2014/nov/14/forex-rigging-investigation-george-osborne-sfo). Libor, Forex, Tesco and there is absolutely ZERO indication that this is just it. At the edge of reason we see the quote ‘Because I don’t want you to see any of my wobbly bits‘, which sounds ample and applicable as the financial district of happily ‘screw everyone over‘, it is all about the wobbly bits, according to Bridget Jones! Consider the Forex articles. The second one is http://www.reuters.com/article/2014/11/14/us-banks-forex-crime-idUSKCN0IY0LV20141114. The issue is not just the events, the quote “Royal Bank of Scotland, HSBC, JP Morgan, Citigroup, Bank of America Corp and UBS were hit with penalties. Barclays is still in talks with authorities over a settlement“, which not just how far the issue has overstepped, but the issue is where banking laws are falling short, short to the extent that we have in access of half a decade. The issues continued after the banking collapse as the financial population continued to be nothing more than an eager courtesan to the bonus they so crave. The end result is a malignant decay of morals, standards and all this now (as I personally see it) on the standards as the poor are left with less than none, so Standards & Poor it is! We now get back to what I regard to be a new level of exploited levelling. Consider the hidden simplicity that Libor held; now consider that debt ratings Moody’s, S&P, Fitch and the relative newbie Egan-Jones decide on ratings. Combine ‘how to lie with statistics‘ (a famous book by Darrell Huff) and the need to manipulate the market for 23 billionaires and we see the light of junk status made Twitter in a whole new light. Consider the basic state of an economy. A company sells, makes profit and pays taxes, a nation flourishes! This is a naive (remember my non-economic degree?) approach towards the worlds cloud of business. Investors, shareholders, analysts and raters are a cog within a machine of cogs. Yet this inner circular machine is different. It inflates, malleably changes and coaches towards a change that seems to be intent on syphoning and draining virtual cash flows into a different premise of profit, which is then turned to actual money. In an age of debts that go beyond the total of all treasuries, virtual numbers that have little to no foundation. The foundations and the levels they have been compromised towards are of a dimension we never imagined possible. Consider that the big banks have been fined in excess of 2.3 billion (at http://www.forbes.com/sites/halahtouryalai/2013/12/04/big-banks-fined-2-3b-over-illegal-libor-cartels-more-fines-on-the-way/), I wrote about it in ‘60% confiscated and counting in Cyprus!‘, on April 1st 2013, yet do not think this article to be a joke. I stated “If this is what frightens the US, then consider the consequences of a system like LIBOR being manipulated through the total value of trade. If that would have been off by 11.2%. Out of $1000T (UK and US combined) then that difference would be $112T“, several people laughed out loud then, yet now consider not just Libor, but the audited events of Tesco, the $5.3 trillion market of Forex and the fact that morality might be found in a church, but as we see the evidence, morality is not found in banks and financial institutions, where will it end? With the Twitter events that question becomes more debatable and the impact that rating companies now impress upon profit turning companies have. Is it just about profit, or about the stated ‘anticipated statement of profit’? As certain ‘analysts’ claim that events are not exceeded, stock becomes junk, waves are created and as such, the welfare of companies are tweaked into a state of artificially changed state, some are inflated, some deflated, but always towards the claim of raters and analysts. The bottom line set towards an algorithm. Consider these states as we have seen not just the change of Tesco, but the events as they also gave way of downgraded profits with Sainsbury, which was not so vocally seen before that day in September. Interactions on many levels, based upon foundations that no one seems to question. Consider how the expectations were set by ‘analysts’ based upon data given to them and data available to them, now consider how Tesco had a quarter of a billion inflated and how the Pricewaterhouse Cooper auditors were ignorant of the inflated condition, now consider how Analysts used that element in predicting waves, the raters predicted and set the value and they are now setting the anticipation of investors and shareholders, an artificial pool with tidal wave creating capacity, and the two elements that have the ability to set the power and size of the waves. So how is your view of financial morality now? Consider the final part in this story. When we consider a story on Fortune titled ‘Twitter is junk, while Alibaba is class, ratings agencies say‘ (at http://fortune.com/2014/11/14/twitter-is-junk-while-alibaba-is-class-ratings-agencies-say/), why is that? Twitter is still holding its own, is it perhaps that the waves of Alibaba can be more easily influenced? Companies valued at the ability where the waves can be decided by the financial cogs, the stability of Twitter is less interesting to them, so they make way for whoever can aid in creating the waves these financial people want. (The last part you read is all speculation on my side), yet speculation or not, when we see the waves of Libor and Forex, are my thoughts so far out of bounds? How Twitter making millions is downgraded, how Tesco, beyond the inflated profits, still made a billion, it’s downgrade of 90% seems excessive beyond punishment, but Tesco is not a good example (because of their own internal manipulation), Consider the Fortune quote “And the fact that Alibaba is 90% dependent on a home market that is slowing, while acknowledged as a risk, doesn’t seem to scare the agencies“, it does not scare them, or it appeals the dependency of Alibaba to make certain decisions down the line? There is a side that seems ignored by all, I personally still have a hard time believing that (as my calculation went in ‘Price Waterfall Blooper‘ on October 25th) the price for 199 auditors could not find two events of inflation of each well over 100 million. Are my suspicions in regards to manipulations that far-fetched? I wonder how long it will take for the law to catch up, for the Department of Public Prosecutions (DPP) or Crown Prosecuting Services (CPS) to get a handle on these events and deter these actions to such a degree. There should be additional questions as the raters are all American, in light of their shortfall that approaches 18 trillion at present. It seems that the US has no options, no solution and no resolution strategy, yet we see that the big four give ratings are all American. The last part is not an accusation in any way, yet the fact that the Auditors need new oversight, especially in the light of American auditing firm Pricewaterhouse Cooper as they will face questions regarding Tesco. As the 4 largest auditors include UK and Netherlands, why are there only American raters (of the proportions of the large 4)? With the risk of manipulation, should there not be a British and even a French or a Dutch rating service? Let’s not forget that PwC faces possible investigation, not because they are more likely than not guilty, but because their innocence needs to be proven beyond any doubt, especially in light of the amount of companies audited by them as well as the issue of 199 auditors (as I calculated them) not finding anything. When we consider the length of time that PwC has had Tesco as a customer, yet, these are two separate issues, there is no inkling of suspicion that auditors are part of any manipulation, yet the auditor’s data is essential to such steps. Not sure if I know of one, laws can be made draconian to give much harsher sentence to the transgressors, but the issue is not the transgressors, the issue is that these ‘manipulators’ have by definition of law not broken any rules. Yes, we see the fines of Libor and soon Forex, these transgressions are seemingly clear, but what of the raters and the analysts? The issues of data are at the foundation here. That what is raw data and how it becomes processed data is now at the centre of it all. That what is construed to be the creator of waves through analysts, raters and auditors; Auditors collecting the data, analysts to manipulate (which is what they might see as a simple application of personal preference and weighting) and raters to set the pace for investors and shareholders. So tell me, how wrong is MY view and why have these influential cogs not been dealt with through legislation?